Getting older doesn’t mean we have to look older. Delaying the effects of aging involves taking care of our bodies by watching our diet, exercising and drinking plenty of water. Taking proper care of our skin also is essential. Avoiding excessive sun exposure, as well as maintaining a healthy skin regimen, goes a long way towards delaying the need for a surgical procedure. 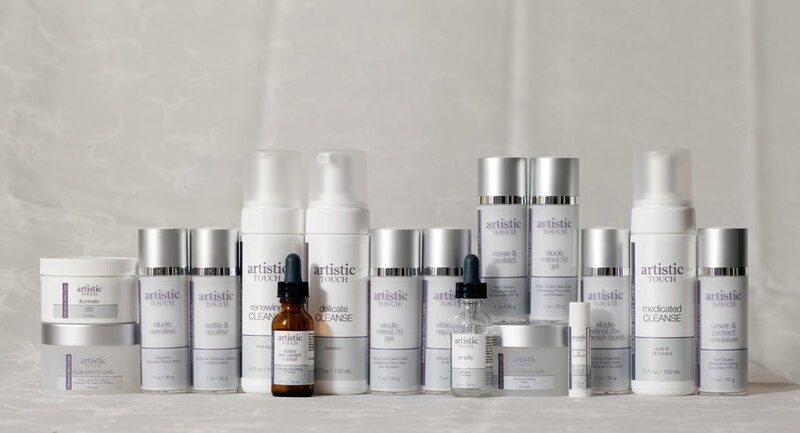 We are pleased to offer the Artistic Touch exclusive line of medical skin care products. This collection of products has been clinically proven to help with the treatment of a variety of skin conditions, including aging skin. Delicate CLEANSE, an extra-gentle cleanser formulated for redness-prone, sensitive and post-treatment skin, contains Evodiox™, a powerful redness-reducing agent derived from the Chinese Evodia rutaecarpa plant. The Foaming Cleanser helps remove excess oils without over-drying the skin, and is 100 percent soap-free. Medicated CLEANSE, a cleansing foam containing a combination of alpha (Glycolic, Lactic acids) and beta (Salicylic acid) hydroxyacids, removes make-up debris and dirt without over drying. Designed for patients with acne-prone skin. Renewing CLEANSE is a gentle, all-purpose skin cleanser designed to remove excess oils without over-drying the skin and contains Salicylic acid with Lactic acid to enhance exfoliation. Designed for patients with normal to oily skin. Contact us today for a free consultation, or to inquire about any of our Facial Cleansers products. Call 402-483-8530. Accelerated Youth Weekly Exfoliating Pads are an integral part of our anti-aging regimen. They work to effectively even skin tone and texture and reduce fine lines and pore size. The high-potency combination of alpha and beta hydroxyacids, when used regularly, can produce superficial results similar to those produced by an in-office chemical peel procedure. Contact us today for a free consultation, or to inquire about any of our Exfoliation products. Call 402-483-8530. Contact us today for a free consultation, or to inquire about any of our Skin Rejuvenation/Anti-Photo-aging products. Call 402-483-8530. Contact us today for a free consultation, or to inquire about any of our Moisturizers/Barrier Repair products. Call 402-483-8530. Illuminate contains potent skin lightening ingredients plus antioxidants. This combination incorporates Kojic acid, Lactic acid, Vitamin C and Green Tea, making it among the strongest and most effective treatments available for hyperpigmentation and melasma. The pads are pre-saturated at the time of purchase to ensure effectiveness. Contact us today for a free consultation, or to inquire about any of our Pigment Management products. Call 402-483-8530. Cover and Protect is a sunscreen formulated with Zinc Oxide and Titanium Dioxide to provide broad spectrum, routine, daily sun protection. The formula also contains antioxidants, Vitamins C and E and Ferulic acid. The addition of melanin, a naturally occurring pigment in the skin, provides even greater protection and gives the cream a brown tint, making it an ideal choice as a foundation or under makeup. The silky, matte finish ensures that makeup will glide on smoothly, without a caked-on appearance or feel. Contact us today for a free consultation, or to inquire about any of our Sun Protection Products products. Call 402-483-8530. Eminence Lip Treatment is a hydrocortisone-containing product that helps reduce excessive lip dryness, itching and inflammation due to dry skin, sunburn or cosmetics. Contact us today for a free consultation, or to inquire about any of our Specialty Products products. Call 402-483-8530. No matter how much independent reading you do you cannot expect to truly be ‘ready’ for the process involved following a double mastectomy with reconstruction. Dr. Mitchell presents information in a clear way and in a way that is unique to you. His demeanor is a quiet one, but I always felt he was concerned and attentive to my situation. My experience, like most, doesn’t follow a completely predictable pathway. Dr. Mitchell has the experience and a calm deliberate practice that is reassuring when all else seems chaotic.